What it Means to Be Food Insecure | Winners Drink Milk! Guest post by Keeley Stevens, Dietetic Intern at Indiana State University. Keeley is studying to be a Registered Dietitian. Planning a meal may be easy for some- you decide what you want, make a trip to the store, purchase what you need, then head home to prepare it. For others, simply making a trip to the store can be a struggle. That’s not to mention needing the finances to purchase food and utilities to prepare it. According to Feeding America, within the United States, 1 in 8 people experience food insecurity. But what does it mean to be food insecure? Food insecurity reflects a person’s access to food, including not having a store nearby, transportation to get to a store, or the funds to purchase it. Thankfully, organizations such as Feeding America are there to help provide families with food banks in their times of need. Did you know that milk is one of the most requested items at the food bank, but the least donated? On average, people served by food banks receive the equivalent of less than 1 gallon per person per year. To support this mission, the American Dairy Association Indiana helps promote the Great American Milk Drive to increase the opportunity for families in need. Additionally, they regularly pair up with Gleaners Food Bank of Indiana to help show the importance of dairy in your diet and ways to incorporate it. Gleaners, a member of Feeding America, has helped over 260,000 individuals struggling with food insecurity. They’ve distributed over 360 million pounds of food and dire grocery products to closely 600 hunger relief agencies and partners serving Hoosiers in need. 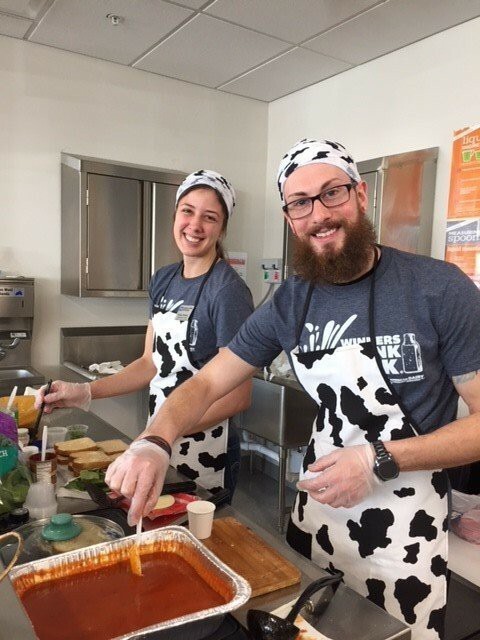 My classmate and I had the opportunity during our internship to represent the American Dairy Association Indiana and provide a simple, nutritious grilled cheese recipe that can easily be made at home. Another benefit is they could find all the ingredients needed at Gleaners food bank. We paired the grilled cheese with a hot tomato soup for a hearty, filling meal. Below you’ll find the recipe that we modified, making it ideal to prepare for kids, while on a budget, or when you just need a quick lunch for yourself! Brush one side of bread with neutral flavored oil, followed by ½ tbsp. parmesan cheese and a pinch of garlic powder. Place in skillet and add provolone, tomato product, a pinch of onion powder, dried basil, spinach, and more provolone. Brush second piece of bread with oil then add ½ tbsp. parmesan cheese and another pinch of garlic powder. Place on top of the sandwich. 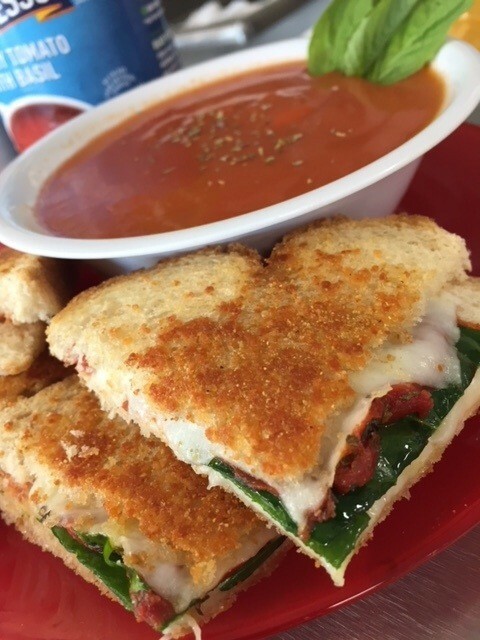 Pair this grilled cheese with tomato soup (mix with 1 cup of milk to increase your calcium and protein) or any other soup of your choosing! Then consider donating to the Great American Milk Drive and help another family.